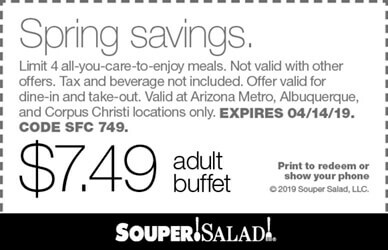 Get adult buffets for just $7.49 with this Souper Salad coupon good today through April 14, 2019. CLICK HERE for your Souper Salad Coupon. Print the coupon or display on your smartphone to redeem. Good for up to 4 people in your party. Good only at select locations; see coupon for details. Tax and beverage not included. Valid for dine-in and take-out, at participating locations only. Souper Salad announced the coupon special in This Email. Souper Salad is a restaurant chain based in Boerne, Texas. Souper Salad is an all-you-care-to-eat buffet restaurant serving fresh salads, made-from-scratch soups, homemade breads, and more. As of October 2017, the chain had 25 locations. The buffet at Souper Salad also includes a variety of soups and salads that contain fewer than 70 calories. To find a location near you, visit the Souper Salad official website.